“Brand Laddering” is one of the most common marketing tools. To drive growth and loyalty, marketers frequently work to elevate benefits of the brand from technical to functional to emotional. But there’s a risk of over-reaching, particularly when brands aim for abstract emotional benefits not really supported by the product story. Brandgym founder David Taylor calls this phenomenon “brand ego tripping”. I gave a talk this week at MARCOM12, the largest marketing conference in the Netherlands. I spoke just after Anne Charbonneau, a partner at Brandgym with David. In Anne’s talk, she mentioned a cartoon I drew way back in 2004 where I made passing reference to the idea of brand laddering to world peace. Her comment inspired me to expand this idea into its own cartoon (and I pasted the original at the bottom of this post). Tapping the right emotional benefit can transform how people think about a brand, and create distance from commodity knock-offs. I saw first-hand how Cheerios successfully laddered from the “first finger-food moment with toddlers” to stand for “nurturing” as a brand benefit, which drove ideas like including children’s books in cereal boxes and supporting literacy. But the right emotional benefit has to be supported by the products. 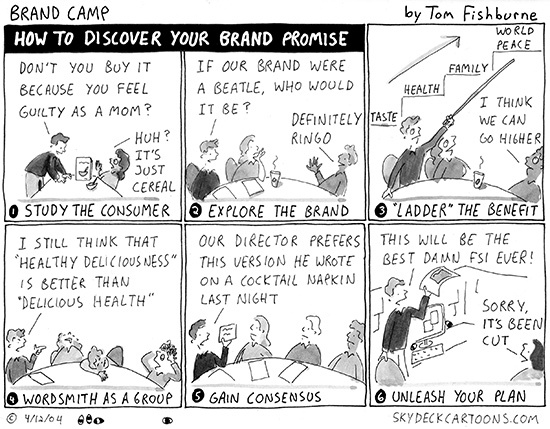 Here’s the original 2004 cartoon, which goes through all 6 stages of discovering your brand promise. I think that brand and messaging strategy sometimes makes us consumers out to be more complex than we really are… And that happens because we marketers are on a quest to find a way to connect that is different from our competitors and we start looking beyond and then way beyond the product itself. Note that I am not saying this is bad or wrong. In fact, the process may be beneficial as it takes us down different paths for positioning and messaging. But sometimes we don’t need to take the ideas to the extreme — just leverage that understanding to develop and deliver the right tone, language, visual feel that is consistent with that direction. I think the challenge is recognizing that consumers are probably not processing messaging and information to the depth we want them to, at least not in the majority. Topics like this always take me back to the Dudley Moore movie “Crazy People” described by IMDB as: “A bitter ad executive who has reached his breaking point, finds himself in a mental institution where his career actually begins to thrive with the help of the hospital’s patients.” Perhaps should be required in some marketing classes as a reminder that sometimes a simple, to-the-point claim can be interesting. I think that it’s all about how far companies take it. How extreme is this far-out benefit you are claiming, and how subtly (or un-subtly) are you trying to promote it? As a young person, I can say that we as consumers are all about “sticking it to the man” and not believing anything we hear in advertising. But for the most part, this is just an outward facade that modern culture has taught us all to adopt. We are “too cool” to believe that owning that a certain car will lead to lifelong happiness, or in this case, corn chips to world peace. 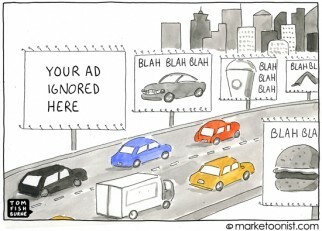 But the reality is that we subconsciously want all of these things, and marketers know this all too well. A discreet, subtle emotional appeal to a deep longing is incredibly effective. The consumer feels drawn to the product, though they can’t necessarily put a finger on why. The problem arises when the higher order benefits are displayed in an obvious fashion. A marketer’s job, therefore, is to strike a balance that appeals to our inner desires without scaring us off with obvious appeals. It’s egoistically easy to forget what we came for: to encourage people to buy stuff. When you find yourself in a room or a meeting where you’re bogged down in minutiae and buzzwords, it’s bold (and possibly politically damaging) to stop things down and go back to the core mission. All the Brand Laddering in the world won’t matter if it doesn’t end with someone saying, “yes, I’ll try that once”. Coca-Cola’s new “Security Cam” ad doesn’t have the feel of 150 people throwing words like “paradigm” and “meme” around to sound important. It’s just a happy little spot that made me smile and YES, it did make me buy a Coke. Score one for the team! I was shocked the first time I saw a shirt with the over-sized Polo on it – I think that is the pinnacle of a “brand ego trip” and I find it garish. As a result, I no longer wear anything with an outwardly facing brand (with the exception of the little red Levi tag on my rear pocket). It’s easy for brand people to get caught up in our own little Brandland bubble, lost in a world of abstractions. Besides, we all want to matter, especially when we spend our days focused intently on something as peculiar as creating a product on a shelf. Connecting with something larger and more meaningful is a natural aspiration–and in this strange little world we live in, it’s easy to lose touch. 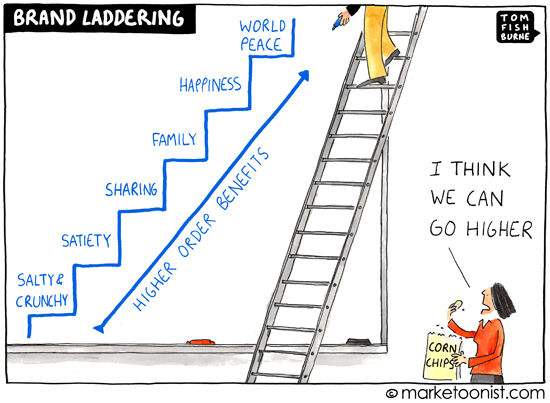 There are real emotional benefits to many, if not most brands. But it takes a lot to discern and articulate the authentic ones, including emotional intelligence, perspective, genuine respect for both the consumer and the product, and humility. Many of these qualities are in short supply in Brandland to begin with–and get actively weeded out as people rise through the ranks. 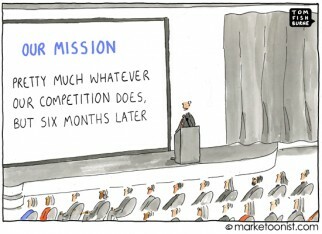 This cartoon beautifully captures the vanity of Brand Posturing(vs. Brand Positioning). Product is fundamental to positioning and a high quality product experience is the sine qua non of emotional attachment. Has the time arrived for marketers to once again embrace product quality? I’ll “ladder” on Bill’s example from ‘Crazy People’, mainly because I loved the honesty in advertising in that movie. Another good one is from the movie ‘The Invention of Lying’. There are many ads for Cocoa-Cola, but the one that stood out (which was rather funny) was the one for Pepsi. The ad said: “Pepsi: When they don’t have Coke.” Genius! I’ve looked over Coke’s recent brand ladder and maybe it’s just me but I don’t open a Coke because I want to “Open Happiness”, I open a Coke because I want a Coke to drink…’Just for the taste of it’. Why couldn’t they just stick with what worked? Great piece! We were just talking about this (bit.ly/KIIhYv) in regards to Nike’s spot celebrating Title 9. It’s not about shoes. It’s about triumph.